Growing up in Queensland, Australia, Mirinda Carfrae, widely known as “Rinny”, was a sporty child, with basketball her primary focus. At 5’ 3”, however, her true athletic potential remained untapped until a high school triathlon coach noticed her speed on the court and suggested she give multisport a go. At the age of 19 she competed in her first triathlon and shortly thereafter–with no prior background in swimming, cycling or running–made the 2001 Australian Junior Elite Team. 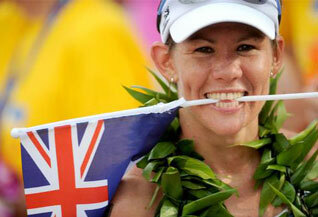 Rinny represented Australia at the ITU Triathlon World Championships from 2001-2005, twice earning silver medals (2002 & 2003) before turning her attention to long distance racing. A victory at the Nice Long Course Triathlon (2004) and a silver medal at the ITU Long Course World Championship (2005) were early indicators that endurance was her forte; a third place podium finish (2006) and ultimately a world title at the Ironman 70.3 World Championship (2007) confirmed Rinny as one of the top talents on the non-draft racing circuit. That victory was pivotal, not only as a precursor to Rinny’s now 20 (and counting) half iron-distance wins, but also as a means to punch her first ever entry ticket to the Ironman World Championship in Kailua-Kona, Hawaii, an honor she postponed until 2009. That October, as a wide-eyed Ironman rookie, Rinny stepped off the plane onto the Big Island and was quickly swept up in the race week frenzy, heralded as the next great hope for the title at triathlon’s “holy grail” despite having yet to prove her prowess at the distance. But prove it she did, using her finely-honed foot speed to post a course run record and secure second place. The following year, Rinny’s constant drive to improve resulted in her first title as Ironman World Champion. In the years that followed, despite race day struggles that might derail a lesser athlete, Rinny never strayed from the podium steps in Kona, earning second (2011) and third (2012) before regaining her crown in 2013. In so doing she struck fear in the hearts of competitors both male and female, posting the third fastest marathon overall (2:50:38), a new run record en route to scoring the women’s Kona course record in 8:52:14. 2014 has been a year filled with exciting new adventures for Rinny thus far. Her winter wedding (December 2013) to fellow triathlete and Ironman Champion Timothy O’Donnell marked the start of a thrilling new chapter in her personal life. Professionally, the reigning Ironman World Champion expanded her horizons to Europe, claiming victory against a highly competitive field at Germany’s iconic iron-distance race, Challenge Roth, and confirming that all eyes will be on her yet again in Kona. When not traveling the world in pursuit of triathlon’s greatest challenges, Rinny and Tim make their home in the endurance sports haven of Boulder, Colorado, along with their stuffed dog Charlie.